1. Identify problems in a set of images. The problem to be rejected should be a small subset of the total number of measurements/images made. 2. Create a black image of zeros (a paint bucket) and using the CloneStamp tool paint zeros on problems. Generally do this to image before registration if the problem is in many images, see below. 4. If applying the painted area to many images, create a CloneStamp process and then apply to many images using an ImageContainer. 5. Register images in the normal way. Nearest Neighbor may give better results. 6. In ImageIntegration set up pixel rejection in the normal way. Make certain the Range Low is set to "0" and Reject Low Large Scale Structures is checked. Comments: Obviously the S/N in rejected areas will be different- however the price may be small if the area isn't "important" or if the area was already a high signal (bright) region. I have not experimented with the effects of registration. I suspect all will work out well even with smoothing due to interpolation. However, performing this step on data after registering images will certainly work. With a large dither- the problem areas may dance around a bit. In the last image, I show the difference of with and without the large scale rejection which takes care of the boundaries very well and makes selective rejection a reality. Nice trick! Thanks for sharing it. I am not certain why a clipping/threshold value of 0 or 1 would matter. The reason I choose the low end was to make certain that the number of high outliers are rejected strictly by statistical means so that "1's" are not included in count of rejections. Using the low end for rejection then seemed better. However, it could be it doesn't matter at all. I've been trying to use this technique to salvage some data with a dust donut, but I'm not having any luck. I can' t get ImInt to reject the pixels that I've painted black. The stacked image shows a very dark area where I painted out the dust donut in those frames, suggesting that the pixels from the blacked-out areas weren't rejected but simply included in the stack. Below is a Dropbox file with twenty images of NGC 660, ten good images and ten where I've painted out the dust donut. I've also included the ImInt icon with my settings, the resulting integration, and the rejection_low map from that integration. The map suggests that Large Scale Pixel Rejection worked as expected, but Clip Low Range had no effect. The technique seems pretty straightforward (brilliant, but straightforward!) 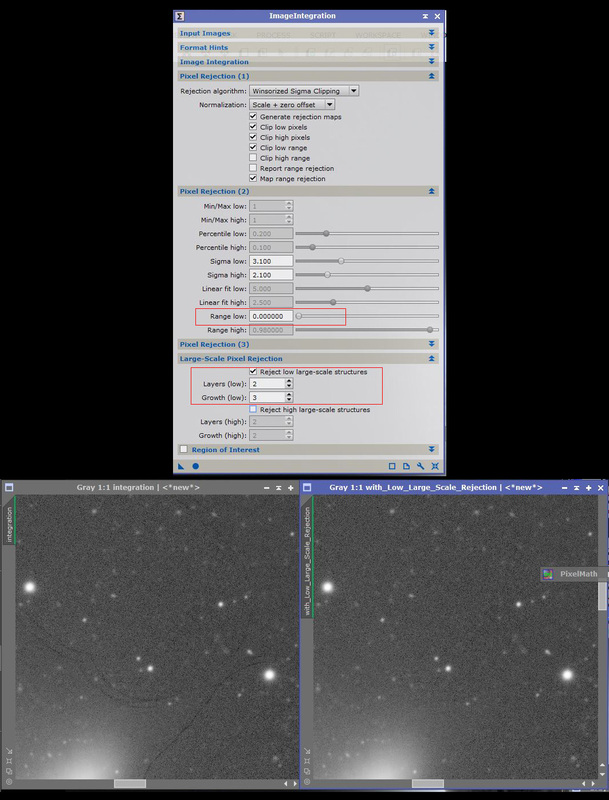 and I watched Adam's explanation on the AstroImaging Channel, and I think I've got the settings right. The data was collected on different nights, so the light pollution gradients are different, but I wouldn't think that would matter. Any ideas? Edit: NM, I figured it out. I thought I was using the hardest brush to paint out the pixels, but in fact I was using the softest brush. It's working now. I have a question, but I'll post that in the General forum.